A look at the overwhelming support of the Oriental Jewish working class for the right-wing bourgeois Zionist Likkud party, and arguing that this support comes from the socio-economic structure of Israeli society. 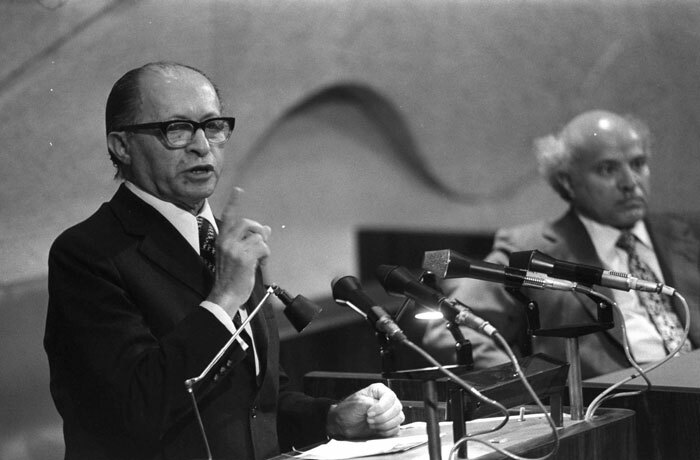 In two consecutive general elections – in 1977 and 1981 – the lower and middle echelons of the Israeli Jewish working class, consisting mainly of Oriental Jews, gave massive (though by no means unanimous) support to the traditional party of the private bourgeoisie, the Likkud, headed by M. Begin. To be more precise, the Likkud is an electoral bloc whose two main components are the fiercely nationalistic Herut (Freedom) Party and the conservative party of traditional bourgeois Zionism, the Liberal Party. The second vote of support came during a period of very rapid inflation (about 130 per cent per year) which had taken its toll of the standard of living of the poorer sections of the working class. Only six months before the 1981 election the economic conditions of wage earners were deteriorating so fast and the popularity of the first Likkud government had sunk so low that hardly anyone believed that Begin would be returned to office. In the event, his party greatly increased its power. Inflation was generated deliberately by government policies as a tool for controlling the economy by manipulating prices, taxes and wages. Just before the elections, the government allowed an artificial but significant reduction in the prices of both foods and durable goods – and it seems that the electorate had been waiting for just such an excuse to sweep the Likkud coalition back to office. This demonstrated ability of the Likkud to retain power even in the face of grave economic difficulties for the mass of their voters raises several questions. In view of the well-known political programme of the Likkud (as demonstrated by the war in Lebanon) these questions are of fundamental importance for understanding Israeli society and its future. It is clear that among Oriental Jews (who form the bulk of the Jewish working class) support for Begin’s Likkud is greater and more solid than among Ashkenazi Jews. In wide sectors of the Oriental population, commitment to Begin is apparently overwhelming and virtually unconditional: he is seen as Saviour. What are the reasons for this phenomenon? How does the voting pattern reflect the specific structure of Israeli society? Obviously, such a clear-cut and powerful sentiment is over-determined: it has several interlinked causes, related to the present social and economic position of the Oriental Jews in Israel, as well as to the painful process of their integration into the Ashkenazi-dominated Israeli society, and to their cultural-political background in the Arab countries. The usual explanation for the voting patterns of Oriental Jews in Israel is that on the whole the nationalist rhetoric and explicit anti-Arab chauvinism of the Likkud appeal to them much more than the relatively moderate and cautious tone adopted by the Labour Party. While this explanation does contain an element of truth, it suffers from several weaknesses. First, in many cases the actual policies of the first Begin government (1977-81) towards the Arab countries, as well as towards the Palestinian Arabs in Israel and the occupied territories, were more open and less harsh than those of former Labour governments. For example, it is now a known fact that when the Labour Party was in office it refused to give up the whole of Sinai in exchange for a comprehensive peace treaty with Egypt; the Egyptians proposed such a deal on several occasions, but were repeatedly rebuffed. Begin’s decision to give up the whole of Sinai and to dismantle the Israeli settlements there in exchange for a peace treaty with Egypt was most vehemently opposed by predominantly Ashkenazi extreme right-wing nationalist groups such as the Tehiyyah (Revival) Party and Gush Emunim; it was also opposed, albeit less vigorously, by the Labour Party. On the other hand, the peace treaty was very popular with Israel’s Oriental communities. Thus, while Begin’s rhetoric is undeniably more openly chauvinistic than that of the Labour Party, his policies were not invariably so, until well into his second term in office. Further, the central and most important plank in Israel’s anti-Arab policy throughout the post-1967 period has been the massive colonisation of the West Bank. But this rapid expansion of the dense network of Israeli settlements has never been popular among the poorer sections of Israel’s Oriental communities. They perceived correctly that to accomplish this massive colonisation the government must channel considerable resources to the small groups of (mostly Ashkenazi) settlers, and away from the ‘development towns’ inside the pre-1967 borders, where a large proportion of the Oriental population resides. Here we would like to consider an entirely different root cause of Begin’s popularity – a deep-level class factor which has had and will continue to have a decisive influence on the political structure of Israel. The existence of such a factor is betrayed by the very form of the support that Begin enjoys among wide sectors of the Jewish working class and petty bourgeoisie: it is an overwhelming and unconditional support, apparently independent on the precise nature of his policies, and often accompanied by strong aversion towards the Labour Party. In fact, a detailed analysis of the public support given to the two major party blocs shows that it is closely related to important divisions in the working class. This division turns out to run parallel to divisions within the Israeli bourgeoisie. Together, they form a striking pattern which has a decisive influence on Israeli society and politics. Let us examine this pattern. The Israeli economy is divided into two major sectors, roughly equal in size: the bureaucratic-capitalist sector owned by the state or the Histadrut and its affiliated organisations, and the private capitalist sector. Obviously, these two sectors are connected to each other by a multitude of economic (and other) ties; in particular, many firms are owned jointly by capital from both sectors. However, there are important characteristic differences, some of which are summarised in the table which follows. This table is no doubt schematic, but it nonetheless highlights some of the characteristics of each sector. One crucial point is the following: the economic sectoral division of the lower echelons of the working class in Israel, between those who work in the bureaucratic and private sector respectively, corresponds rather closely to the national division of that class, between Israeli Jews and Palestinian Arabs. This is not a mere coincidence; it is rooted in the very nature of Israel as a Zionist settler-state, and its consequences are far-reaching. Ever since the beginning of the Zionist colonisation of Palestine, the Zionist labour movement sought to create a Jewish monopoly in certain key sectors of the economy. This was done by excluding Arab workers from these economic activities. This policy continued after the 1948 war: industries and economic activities which were under the control of the state or the Histadrut (including its affiliated organisations, such as the kibbutzim) were generally closed to Arab workers. With the rapid development of the economy, especially after the 1967 war, a total ban on Arab labour could no longer be maintained, since there was an acute shortage in labour-power. Thus the public construction industry came to depend on Arab labour. Today the giant Solel-Boneh construction concern relies almost exclusively on Arab manual labour. This concern belongs to the Histadrut – the peculiarly Zionist bureaucratic structure, which combines in one entity the country’s only legally recognised trade union and largest industrial holding company. But in most other Histadrut-owned enterprises Arab workers are not to be found. As for state-owned industrial firms – they are almost hermetically closed to Arabs. Thus Arabs are excluded not only from the huge state-owned arms industry, which employs over 100,000 people, but also from the oil and chemical industries, electronics, aviation, ports, the sophisticated parts of the engineering industry, shipping and airlines. It goes without saying that telecommunications, the electricity and gas industries and the like are also closed to Arabs. All these are considered strategic areas, and Jewish monopoly is maintained in them not only at management level but also, with very few exceptions, among the workforce. The technique of keeping Arabs out is simple: all employees are required to have a record of military service and a security clearance. This automatically rules out all but a very small number of Arabs. The few exceptions – mostly members of the Druze religious sect, who are conscripted to the army – are dealt with individually. Even the Druze are excluded from most ‘sensitive’ and strategic areas of employment, but their exclusion is not total. Thus, for example, about half of the manual workers in Israel’s biggest sea-port, at Haifa, are now Druze Arabs: the shortage in manpower was so acute that they had to be admitted into this former bastion of exclusively Jewish labour. The policy of keeping Arabs out of the strategic industries has created a shortage of skilled and semi-skilled labour in these industries. Since the mid-1970s, the shortage has been getting progressively more acute, because military-related production has become the fastest growing area of Israel’s economy; by now, it employs about one quarter of the country’s total labour force.1As a result, the Jewish workers in these industries have been able to obtain relatively good working conditions and fringe benefits: higher pay, shorter working week,2 longer holidays, greater job security. Managements have been forced to grant all this, in order to attract enough Jewish workers. Similar conditions do not generally exist in private industry, except where the work-force is highly skilled and purely Jewish – again for ‘security reasons’. Some of these points are well illustrated in the following excerpt from an article in a local Jerusalem newspaper. As a result of this division, firms in the private sector are utterly dependent on Arab workers. From the viewpoint of the private employer, this state of affairs is not an unhappy one: while there are political barriers to the super-exploitation of large sections of the Jewish working class, Arab workers do not enjoy similar political protection. The private employers can therefore go much further in squeezing the utmost out of their workers, while keeping wages and working conditions to the minimum level that the labour market will bear. These developments in Israel’s private sector were given a tremendous boost by the outcome of the 1967 war, which opened to the civilian consumer-goods industry a huge new market. Israeli consumer goods are sold not only in the West Bank and the Gaza Strip, but are also carried (often after being repackaged, to disguise their origin) across the ‘open bridges’ into the Arab countries. At present, this accounts for about one third of Israel’s total exports. At the same time, the territories occupied in 1967 provided Israel’s private industry with a large new labour market, more than doubling its reserve of Arab workers. More than 100,000 workers from these territories are now employed in various branches of the Israeli economy. These developments, which matured during the 1970s, have had two important political consequences that concern us here. First, the ranks of the private Jewish bourgeoisie were swollen and it became considerably more independent of the state bureaucracy. The ability of the private sector to take care of itself economically and politically was greatly enhanced. Its appetite for political power, to complement and reflect its newly acquired economic muscle, was rapidly whetted – and it now had the financial means to mount a proper large-scale election campaign. Second, due to the vast expansion of the public-bureaucratic sector, especially the arms industry, and the resulting shortage of Jewish labour-power, the Jewish working class also became increasingly independent of the state and Histadrut bureaucracy and its political arm, the Labour Party. One no longer had to vote Labour in order to get a proper job. The division of the working class according to nationality, between the public-bureaucratic and private sectors, is supplemented by an important division of the Jewish wage-workers along the major ethnic cleavage which divides Israeli Jewish society: between Oriental Jews (mostly immigrants from Arab countries, and their Israeli-born descendants) and Ashkenazim (Jews of central and eastern European origin). The bulk of the Jewish working class – especially in non-managerial, manual jobs, whether skilled or not – is made up of Oriental Jews. While the formula for separating Arabs from Jews is ‘military service’ and ‘security clearance’, the euphemism used for excluding Oriental Jews is ‘education’. Most white-collar government jobs are filled by Ashkenazim. Some government departments, such as the Post Office, have no educational requirements, and indeed a very high proportion of workers there, including white-collar employees, are Oriental. However, for most Oriental Jews, especially those who live in ‘development towns’, far from the central government sites of Tel Aviv and Jerusalem, the only way to secure a respectable job is to join some firm owned by the state or the Histadrut (including firms owned by organisations affiliated to the Histadrut, such as the big public transport firms and ‘regional enterprises’ owned jointly by several kibbutzim and employing hired labour). As mentioned above, these firms are dominant in ‘strategic’ branches of the economy such as arms production, the chemical industry etc. Competition with Arab workers in the private sector makes that sector very unattractive to Oriental (let alone Ashkenazi) Jewish workers. Of course, this does not mean that no Jewish workers are employed in the private sector; many are. But their preference is to work in the public-bureaucratic sector. The pattern which has resulted from the operation of these selective forces over the years is that the typical employment of the ‘average’ Oriental Jewish worker is in a blue-collar job in the public-bureaucratic sector, usually in a ‘strategic’ industry. Let us now return to our original question and see how the political inclinations of Israel’s Oriental Jews are affected by their specific position within the country’s economic and cultural life. As we saw, the vast majority of Oriental Jews are employed in manual jobs, mostly in the public-bureaucratic sector. While their position is superior to that of the Arab workers, it is inferior to that of the Ashkenazim, who hold most of the managerial and professional jobs. Ever since the early 1950s, when large waves of Jewish immigrants arrived from Arab countries, these immigrants were regarded by the Ashkenazi Zionist elite as an inferior group who must somehow be ‘raised’ to the true cultural level of Jewry – represented by the Ashkenazim. Clearly, some groups of Oriental immigrants had to go through a painful period of adaptation in order to acclimatise to a society fashioned by European, bourgeois-liberal and mostly secular traditions. But this difficult process of adaptation was made worse by the attempts at a forced Europeanisation of all aspects of their life. Although as a matter of fact many of the new Oriental immigrants had belonged to the middle-class and professional strata in their countries of origin, a stereotype of Oriental Jew was created in the image of the least educated and most backward (from a bourgeois point of view) among them. When the Oriental Jews were slowly and painfully integrating into Israeli economic life, they always faced the Ashkenazi Jew as a contemptuous boss who was ordering them about and on whose goodwill their very livelihood depended. Their immediate class enemy – the boss – was most often a Labour-Party bureaucrat put in control of this or that Histadrut or state enterprise. Moreover, their trade-union ‘representative’ in the Histadrut was again an Ashkenazi, nominated from above or entrenched in this position since the old pre-state days. The government and Histadrut offices in charge of their education, housing, welfare, employment and health-care were also staffed almost exclusively by Ashkenazim. For many years they were coerced to vote for the party of this state-bourgeoisie and union bosses – the Labour Party. This political coercion was most effective outside the main urban centres, in villages and smaller towns populated almost exclusively by Oriental Jews. There, improvements in employment, housing etc. could be made conditional on ‘favourable’ electoral returns. (In the large cities this type of blackmail was less effective, and a large proportion of Oriental Jews living there indeed used to vote for Herut even in the early days.) Political coercion of this kind was gradually becoming more difficult to enforce, with the general liberalisation of Israeli economic and political life, especially after the fall of the first Big Boss, David Ben-Gurion, Israel’s first Prime Minister and for many years leader of the old Labour Party (Mapai). What routes of upward socio-economic mobility were open to an Oriental Jewish worker? In the public-bureaucratic sector (including the armed forces) such mobility was slow and difficult, if not entirely impossible. Managerial and supervisory positions in this sector were firmly held by Ashkenazim. The educational route upwards was also largely blocked: to this day, the number of Oriental Jews in universities is relatively very small, partly because tertiary education is economically beyond the reach of most working-class families and partly because children of Oriental families are handicapped by the inferior quality of primary and secondary education accessible to them. On the other hand, there was a route of advancement open to an Oriental Jew – that of becoming self-employed or an owner of a small private business. In the free market of the private sector, the way up was much easier than in the public-bureaucratic sphere. As a result, there sprang up a very substantial number of small independent businesses owned and run by Oriental Jews. The typical aspiration of an Oriental Jewish worker – if there is such a thing as ‘typical aspiration’ – is to rid himself of his dependence on the Ashkenazi bosses and start his own small workshop, where he would employ, say, three, four or even twenty Arab workers, with whom he has a lot in common culturally but who would be kept in their ‘proper place’ by the national social barrier. Nor is this mere wishful thinking; thousands of businesses of exactly this type – restaurants, small construction firms, carpentries, garages and the like – have come into existence, and many have prospered. The complex reality determines class consciousness. The Labour Party is correctly regarded by most Oriental Jews as the party of bureaucratic bosses, hated by workers and small businessmen alike. The Likkud is regarded as the party of the class they identify with, the class of small businessmen, to which most Oriental Jews would like to belong and some do already belong. The working-class rhetoric of the Histadrut bosses is seen and despised for what it is – mere rhetoric which attempts to cover up the role of the Histadrut as the biggest employer in the country. The Labour Alignment (including the Labour Party itself) is also strongly associated with the kibbutz movement, deeply hated by most Oriental Jews. This hatred combines resentment at social discrimination, and class hostility towards a powerful collective employer. A large proportion of Oriental Jews brought to Israel were settled – it felt more like being dumped – in small ‘development towns’ in remote corners of the country, with meagre economic base and few resources for real development. In the same localities, heavily subsidised kibbutzim have prospered as small agro-industrial communities. The 100,000 odd members of kibbutzim form a peculiar layer of Israeli society; it can perhaps be best described as Israel’s equivalent of the English landed gentry. The cultural, social and political background of the kibbutz is totally alien to the Oriental Jews, who therefore find it virtually impossible to join these oases of prosperity. Even in the rare cases when they try to join, their ‘mentality’ is usually judged to be ‘unsuitable’. On the other hand, the rapidly developing economy of the kibbutzim has become increasingly dependent on the exploitation of wage labour. About half of the labour-power employed by the kibbutzim comes, in the form of wage labour, from the Oriental communities in such ‘development towns’ as Qiryat Shmonah in the north or Sderot in the south. Some of these workers are hired by individual kibbutzim; many others work in ‘regional enterprises’ owned and managed jointly by several kibbutzim and relying exclusively on hired manual labour. These Oriental hired workers of the kibbutzim sometimes work alongside Arab workers, but they rarely meet kibbutz members except as bosses, managers and supervisors. Here is an excerpt from an Israeli newspaper report on the town of Qiryat Shmonah, where public meetings of the Labour Party, addressed by the party’s leader, Shim’on Peres, were broken up by the angry Oriental inhabitants. It is perfectly natural that the relationship between the two communities is that of total estrangement. The kibbutzim are perceived as the darlings of the state, who have got the best land, water and other resources, such as cheap credit, and who thrive by exploiting the miserable living conditions and the political weakness of the Oriental Jewish workers. This political weakness is what Israel’s Oriental Jews are trying to reverse by voting Likkud. The Labour Alignment is closely identified with the kibbutz movement; during election campaigns, kibbutz members go into the development towns to solicit votes for Labour; and a relatively high number of Labour candidates are members or ex- members of kibbutzim. For most Oriental workers it is unthinkable to vote for such people, and will continue to be so for the foreseeable future. They are seen as arrogant bosses, who should be politically checked, not encouraged. The political allegiance of Israel’s Oriental Jews to the Likkud, and their rejection of Labour, are firmly rooted in the history and class structure of Israeli society. It does not depend very much on the position taken by the Likkud on this or that national or economic issue. Begin will have their support both in taking chauvinist positions and in adopting more moderate stands. This contrasts sharply with the support that Begin enjoys in the fascist-religious milieu of Gush Emunim or the Tehiyyah (Revival) Party, whose members are mostly Ashkenazim. This latter support is entirely conditional on the Likkud’s commitment to a Greater Israel, from which Palestinian Arabs are to be expelled. The political support of the Likkud among Israel’s Oriental Jewish working class can be expected to continue for quite some time. It may decline slowly, following changes in the ethnic composition of the state-bureaucratic section of the Israeli bourgeoisie. Such changes may come about precisely as a consequence of the Likkud staying in office long enough, especially if it will succeed in capturing the Histadrut, in addition to the state apparatus which it already controls. 1. For a survey on Israel’s arms production and exports and the militarisation of the Israeli economy, see Esther Howard, ‘Israel, the sorcerer’s apprentice’,MERIP Reports 112, February 1983. 2. The normal working week in Israel is six days. 3. For details on the role of Arab labour in the Israeli economy, see E. Farjoun, ‘Palestinian workers in Israel – a reserve army of labour‘, Khamsin 7. 5. Concerning the attitudes of the Zionist elite to Oriental Jews, see R. Shapiro, ‘Zionism and its Oriental subjects‘, Khamsin 5. 6. Ha’aretz, 4 November 1982.